A plea for critical pragmatism I suspect pragmatism is one of the most neglected and misunderstood traditions of philosophical reflection on research and professional practice. A number of different strands of philosophical pragmatism exist today, but for me the most important source of inspiration for pragmatist thinking remains the work of the three main founding fathers of American pragmatism, Charles S. Peirce [1839-1914], William James [1842-1910], and John Dewey [1859-1952]. With this edition of the Bimonthly, I would like to start a series of short reflections on some of the chances and difficulties that I associate with their ideas. I will particularly consider their continuing importance for the issue that is central to my current academic work, of how philosophy can encourage and support reflective professional practice in the applied disciplines. “Critical pragmatism” as I propose to understand it pursues two basic aims: first, it aims to rediscover pragmatism as a useful method of critical reflection; and second, at the same time, it aims at a critical revision of the core concepts of philosophical pragmatism itself. Terms For the sake of terminological clarity, I will speak of pragmatist rather than pragmatic thinking when I mean to refer to the philosophical rather than the everyday, common-sense meaning of pragmatism. Furthermore, I will speak of American pragmatism or simply “(philosophical) pragmatism” when I refer to pragmatist philosophizing in the tradition of Peirce (1878), James (1907), and Dewey (1937); by contrast, I will speak of “critical pragmatism” – a term yet to be explained – when I refer to my own ideas for developing pragmatism into a contemporary framework for reflective practice. (2) How can we philosophically ground ethical practice? For neither of these two questions, we have today an operational theory or model that would provide us with a practicable, positive answer; all philosophical thought thus far has been unable to demonstrate a secure methodological path to rational and ethical practice, and I would argue that as a matter of principle, in the realm of applied science and expertise we can and should not aim for such a "secure path," certainly not in the way Kant (1781, p. Bxvi) could still unreservedly talk of the "secure path of science." We should thus not expect pragmatist philosophy to have all the answers. In any case, in a world that is becoming ever more pluralistic and multifaceted, it makes little sense to expect any particular school of philosophy to come up with the right answer. The more pragmatist philosophizing makes sense today. Due to its orientation towards practice, we can very well expect pragmatism to help us deal with the lack of ready-made answers. This is why a revival of interest in pragmatist thinking seems timely. The need for a critical revision of philosophical pragmatism Pragmatism as a philosophical strand of thinking has always remained somewhat controversial and continues to be held in rather low esteem by many philosophers as well as by many researchers and professionals, although perhaps less so in North America than in Europe and other parts of the world. The basic reason is obvious and easy to refute: philosophical pragmatism continues to be confused with pragmatism in an everyday sense of the word. In its everyday sense, pragmatism appeals to common-sense and utilitarian thinking and tends to equate proper notions of meaningfulness and validity with what is "expedient"; a notion of pragmatism that runs counter to the philosophical quest for grounding reflective (rational and ethical) practice. More serious and less easy to refute is a second reason for the low esteem in which pragmatism is often held. It has to do with what I would describe as a certain methodological weakness of American pragmatism when it comes to defining rigorous standards and procedures for rational and ethical practice, and for research or professional intervention in the service of such practice. It is this second difficulty which will mainly interest us in this series of reflections. However, rather than looking back on the history of ideas and asking what went (partly) wrong with the reception of pragmatist philosophy, I suggest that we adopt a forward-looking stance and ask ourselves: What can we do today to overcome the apparent methodological weakness of pragmatism, so as to tap its full potential as a method of reflection? In this initial discussion, I would like briefly to explain a core reflection on which my answer to the above question relies. In future contributions to the Bimonthly, I will then explore more specific aspects and implications of the search for a methodological strengthening and renewal of pragmatism. The critical kernel of pragmatism It appears to me that part of the answer can be found hidden (or forgotten) in pragmatism itself: pragmatism as I understand it contains a much-neglected critical kernel. This becomes apparent as soon as we consider the core principle of pragmatist thinking, the "pragmatic maxim" of Charles S. Peirce (1878). The pragmatic maxim stipulates that the meaning of an idea or proposition consists in the sum-total of the practical bearings that we conceive it to have. Accordingly, we can clarify the meaning of an idea or proposition by asking what difference all the effects we anticipate it to have, taken together, make to us and to others. Peirce himself understood the principle in a rather narrow way, as a rule for clarifying the empirical content of observations and theoretical hypotheses in experimental science; but as James (1907) first taught us, its importance goes far beyond the laboratory of the experimental scientist and applies to everyday contexts of speech and action as well as to the applied disciplines. Furthermore, if we really take it seriously, it requires us to explore not only the empirical (or factual) but equally the normative or value content of our ideas and propositions. The difficulty with such an understanding of Peirce's method for clarifying the meaning of a claim is this. In a world of complex interdependencies, there is no natural end to the process of unfolding all potential "practical bearings" of a proposal. Yet all practice – professional practice no less than everyday practice – needs at some point to pass from research and debate to specific action and thus cannot endlessly explore ever more potentially relevant facts and concerns. Selectivity, not comprehensiveness, is the fate of all practice (Ulrich, 2007, p. 1110). This is why in my work on critical systems thinking and reflective practice, a crucial point is that for all practical purposes, the meaning and scope of valid application of an idea or proposition depend on our boundary judgments (Ulrich, 1983) as to what "facts" (observations and forecasts) and "values" (worldviews, ideals, ends, and norms) are to count as relevant and what others are not so relevant. These judgments (as the word is meant to suggest) are not given to us by nature but need to be made in the course of all professional intervention and everyday practice. Unfortunately, Peirce's wording of the pragmatic maxim ignores this difficulty; it effectively requires us to consider all the "practical bearings" that a proposition may have. Amazingly, the huge body of literature around Peirce's pragmatic maxim has hardly ever questioned this rather heroic (if not hopeless) call for holistic knowledge and understanding. As if we could ever be sure to be truly holistic in our outlook and reasoning! The prevalence of unexpected "side-effects" and long-term consequences of applied science and expertise should certainly caution us in this respect. In view of the complex interdependencies that govern our modern world, it is a tall order indeed to anticipate all the conceivable consequences and value implications that a proposal may have in all future, and even more so to carry the responsibility for unforeseen consequences and implications. You may want to say, "not 'in all future' of course, but only with a reasonable time horizon," but then you have already assumed a boundary judgment that not everyone else need share but which may well be crucial for the way different people see and value a proposition (think, for example, of the issues of nuclear energy policy or of genetically modified crops). The critical turn of pragmatism The difficulty we have identified above, and the critical kernel that I accordingly associate with the pragmatic maxim, explain why pragmatism as it is usually understood – as requesting us to consider all the practical implications of a proposition – is bound to remain methodologically weak: holism is not a practical idea. There is no conceivable way we could translate Peirce's pragmatic maxim into an operational model of rational research and practice. I therefore do not find the usual holistic understanding of the pragmatic maxim helpful but prefer instead to understand it as a critical principle only. It then yields a new methodological core idea for supporting reflective practice: we can now understand and operationalize reflective practice as a systematic effort of boundary critique, that is, a methodologically supported process of critical reflection and debate on the boundary judgments that in a concrete situation define which "facts" and "values" are recognized as relevant and which others are not. Once we have understood this core reflection, it becomes obvious that without such an effort of boundary critique, pragmatism is bound to remain methodologically weak and indeed, arbitrary! It should then hardly surprise us that philosophical pragmatism thus far has not successfully been translated into some practicable philosophical framework(s) for applied science and expertise. I hope to pursue this vision of a philosophy for professionals (Ulrich, 2006b) in some future reflections on the revival of philosophical pragmatism. In the meantime, you may wish to familiarize yourself with some of my previous writings on the suggested "critical turn" of pragmatism (see, e.g., Ulrich, 2000, 2001, 2006, and 2007). Dewey, J. (1937). Logic: The Theory of Inquiry. Wiley: New York. James, W. (1907). Pragmatism: A New Name for Some Old Ways of Thinking. Longman Green & Co: New York. Kant, I. (1781). Critique of Pure Reason. Translated by Norman Kemp Smith. New York: St. Martin's Press 1965 (orig. New York: Macmillan, 1929). Peirce, C.S. (1878). How to make our ideas clear. Popular Science Monthly, 12, January, pp. 286-302. Reprinted in C. Hartshorneand P. Weiss (eds) (1934), Collected Papers of Charles Sanders Peirce, Vol. V: Pragmatism and Pragmaticism, Harvard University Press: Cambridge, MA, para. 5.388-5.410. Peirce, C.S. (1902). A note on pragmatism. In Ch. Hartshorne and P. Weiss (eds), Collected Papers of Charles Sanders Peirce, Vol 5., Pragmatism and Pragmaticism, Cambridge, MA: Harvard University Press, 1934, para. 5.13 note 1. Ulrich, W. (1983). Critical Heuristics of Social Planning: A New Approach to Practical Philosophy. Bern, Switzerland: Haupt. Reprint edition Chichester, England, and New York: Wiley 1994. Ulrich W. (2001). The quest for competence in systemic research and practice. Systems Research and Behavioral Science, 18, No. 1, pp. 3-28, there esp. pp. 11-15 and 23f. Ulrich, W. (2006). Critical pragmatism: a new approach to professional and business ethics. In L. Zsolnai (ed. ), Interdisciplinary Yearbook of Business Ethics, Vol. I, Oxford, UK, and Bern, Switzerland: Peter Lang Academic Publishers, 2006, pp. 53-85. Ulrich, W. (2007). Philosophy for professionals: towards critical pragmatism. Forthcoming in Journal of the Operational Research Society, 58, No. 8 (August), 2007, pp. 1109-1113. 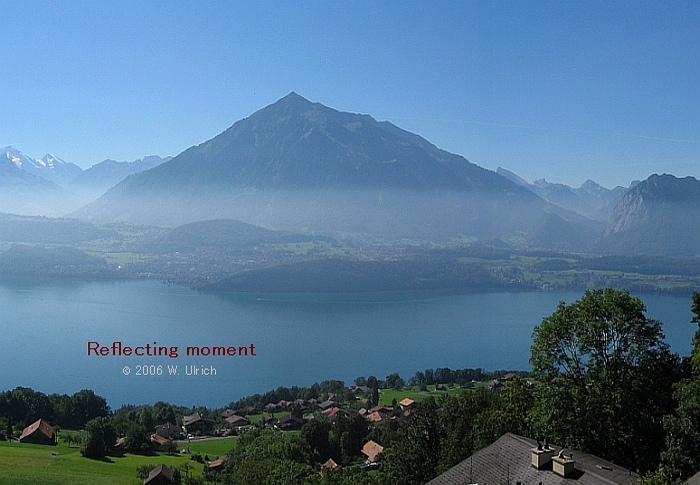 Picture data Digital photograph taken on 18 September 2004 around 8:30 a.m. from the northern slopes of Lake Thun, Switzerland. Exposure time 1/500 seconds, aperture f/3.2, ISO 50, focal length 7.81 mm (equivalent to 35 mm with a conventional 35 mm camera). Original resolution 2231 x 1507 pixels; current resolution 700 x 485 pixels, compressed to 132 KB. (adopted from Charles S. Peirce, 1902).